Isn't it funny how sewing inspiration strikes? I'd had this red flowery viscose in my stash since last summer, but didn't have a plan for it. That was until I saw these two lovely makes from Sarah from Like Sew Amazing, and Abi from The Crafty Pin Up. Sarah made a tea dress from the same fabric, and Abi made a Sew Over It Doris dress, so I though it would be a nice idea to combine the two. I'd been swapping over my winter and summer clothes and this dress has been a favourite, so I thought I'd re-use the pattern. This time I added a proper button placket, and had grand plans for adding the same capped sleeves. Stupidly I cut out the wrong ones, and didn't have enough fabric to re-cut as I had used the leftovers to made bias tape. Oh well. The skirt is my good old half circle skirt, and the fabric is some viscose from Cotton Reel Studio. They don't have it anymore, but I know I've seen it at Like Sew Amazing. The fabric was stablised with some spray starch, which helped a lot. The neckline and armholes are finished with the aforementioned bias tape, and it has side seam pockets and a centre back invisible zip. I got a rolled hem foot with my Elna 680 when I bought it a two and a half years ago, but had never used it (you can't rush these things...). So I thought I'd finally give it a go, and it turned out not to be as difficult as I thought. This Singer video was very helpful. This is also my entry for the #handmadesummerdress challenge. Thanks to my pal Suzie for putting me onto this. 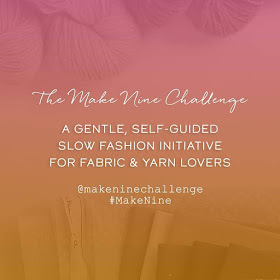 This is being run by Lisa from And Sew On, and Andréanne from The Minimal Approach. And, it is actually sunny here in Belfast today! And finally, if you follow me on Instagram, you'll know that I'm in this month's Love Sewing magazine, which is very exciting! There a piece by the fabulous Angeline Murphy who is chatting about sewing in Northern Ireland. 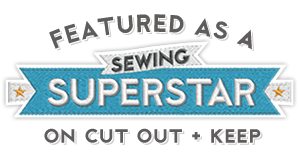 I get a mention along with Suzie from Threadquarters, Christine from Colour and Cloth, and Susanne from Sew Custom. If your from Northern Ireland and you sew, then hop on over to Instagram and use the hashtags #northernirelandsews or #belfastsews to find more of us, because we're out there! Absolutely gorgeous dress Lynne. Your hem is beautiful. I'm ashamed to say I've had a rolled hem foot for literally decades but never managed to make a neat hem with it despite my efforts. I'll have a look at the video you suggest. Thank you. I really like your sleeveless version of the dress. Thanks Elaine! I think I got quite lucky with this viscose for the rolled hem, as it's relatively thicker that say a silk or chiffon. I've yet to see how it would work out in either of those fabrics! Thanks Colette! Totally agree, and as we all know, red is a neutral!! Another lovely dress Lynne - perfect for summer! Thanks Ruth! I can confirm that it is, as the weather has been lovely in Belfast. Congratulations at your magazine appearance! Your dress is lovely, we just need some summery weather so you can show it off! Thanks Helen! The weather has been brilliant this week, so it's summer clothes all the way!